Dontcha just love this time of the year? For me, it’s a time to dust off my cake decorating supplies and skills and have tons of fun in the kitchen making adorable and festive Halloween treats. 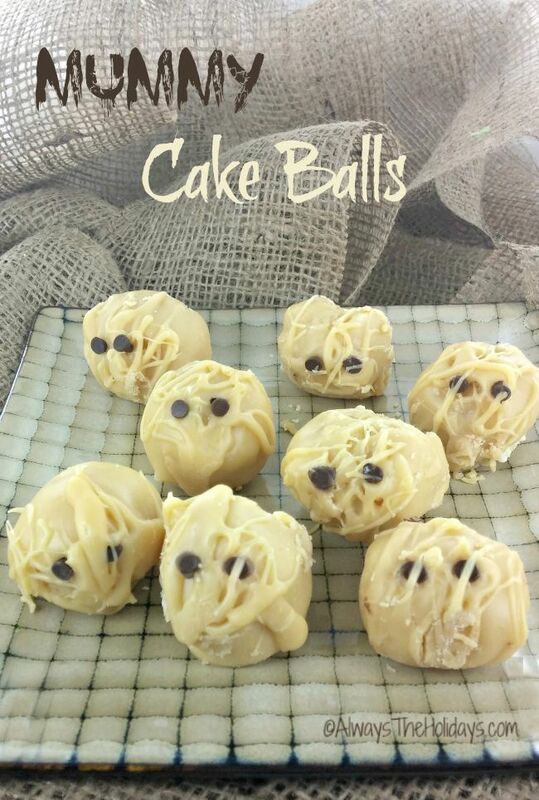 These mummy cake balls are so much fun to make and will add a whimsical touch to your Halloween party table. Add a Whimsical Look to Your Halloween Table with these Mummy Cake Balls. They are so cute and eerie looking. The kids will love ’em and you will find that one (or ten!) end up in your mouth too. This is the first time that I have made cake balls and there is a bit of a learning curve with them, but that is more on the dipping than the making part, at least for me. The first step is to make a cake. I used a yellow cake mix, but really any flavor will do. Once the cake is made, let it get very cool and then break it into crumbs. Beat together the cream cheese, powdered sugar, butter, and skim milk in a stand mixer. This mixture adds some richness to the balls that makes them almost like truffles. Just shoot me now….there goes my diet! Now comes the fun part, at least for me. I am one of those kids who loved to get their hands dirty. Into that bowl I went, making all that gooey mixture into a big blob of cake batter crumbs cream cheese goodness. And I can’t guarantee that I didn’t lick my fingers when I was done either! 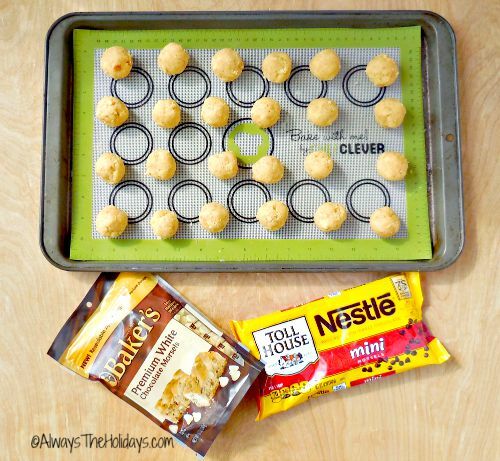 Take spoonfuls of the mixed up deliciousness and make them into balls. I used a silicone baking mat to put them on. Really easy to clean up after and I could put it right into the freezer. Did I mention put them in the freezer? I didn’t do that on the first round that I made. Let’s just say, room temperature cake balls and melted white chocolate don’t like each other. Well, actually they like each other a bit too much. Bits of those balls just dove right into that melted chocolate and decided to remain in chocolate heaven. Round two. The balls go nto the freezer to make them get nice and firm before their white chocolate bath. Success! Adding a bit of skim milk from time to time, helped me to keep my chocolate at a good dipping temperature. Onto a wire rack they go. Perfect for a Halloween party table. 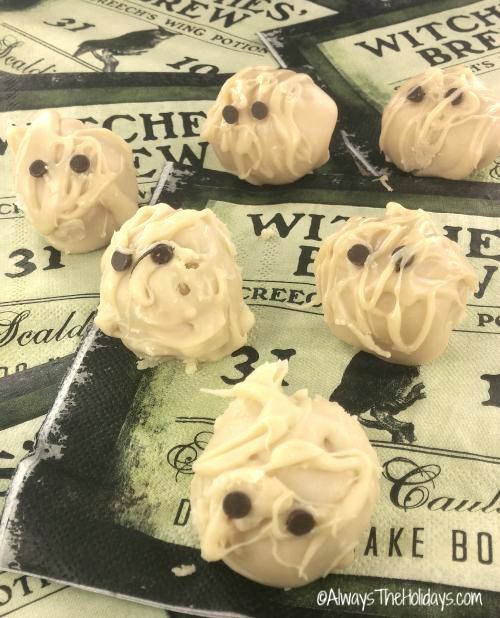 These mummy cake balls are rich and decadent. They are one big bite of yum. I guess I would be a nice wifey if I were to show Richard where my private stash is kept, but would I? Could I? Time will tell….after all those mummies and I are BFF right now! Be sure to also check out these Oreo mummy pops, too. Great for a last minute Halloween snack. 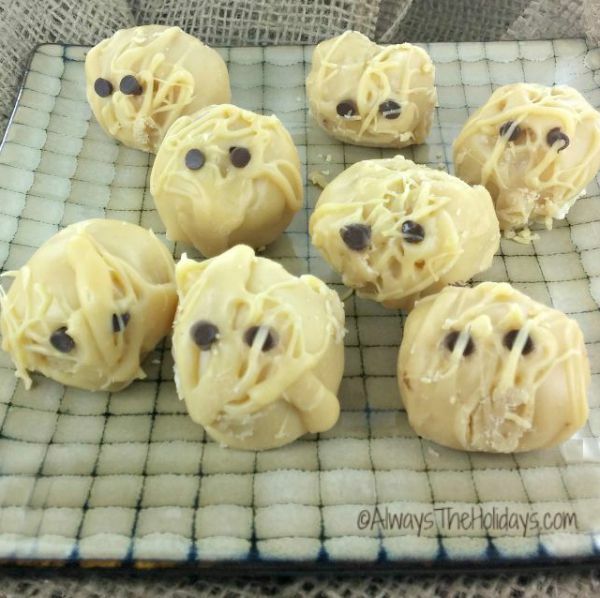 These fun mummy cake balls are the perfect dessert for your Halloween dessert table. I Betty Crocker Butter Recipe Yellow Cake Mix. Bake the cake and let it cool completely on a rack. Ideally, let it cool overnight or for several hours. When it is completely cooled, break up the cake into a large bowl. Crumble it with your fingers until it becomes fine crumbs. In the bowl of a stand mixer, whip the cream cheese, butter, powdered sugar, and skim milk together until smooth. 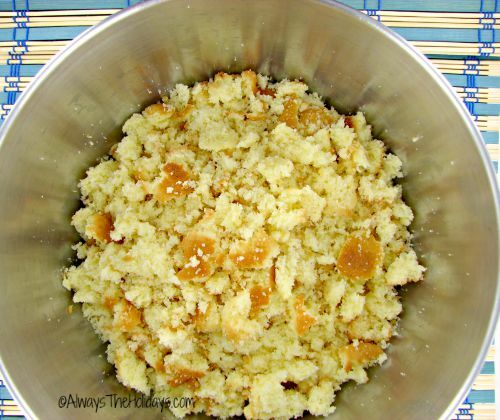 Pour this mixture into the cake crumbs and mix together with a spoon. Using your fingers, continue mixing and kneading until all the ingredients are fully mixed into the cake crumbs. Try to make a ball, at this stage. If it needs a little extra moisture, add some skim milk a teaspoon full at a time. When the mix has the correct consistency, cover with plastic wrap and refrigerate until it becomes firm. (This keeps well in the fridge for several days and also freezes if you do not want to make it all at once. Cover two large baking sheets with parchment paper or a silicone mat. Take a spoonful of the cake mixture and roll it into a firm ball. Repeat until you've used up all the mixture. Place them in the fridge or freezer to harden as each sheet fills up. Melt the Baker's white chocolate in a double boiler on the stove. Stir well. Using a bamboo skewer, dip each ball into the white chocolate until it is well covered. Place the balls on the parchment paper or baking mat. Place the remaining white chocolate into a piping bag and drizzle it onto the tops of the balls in a criss-cross manner to resemble a mummy wrap. Insert two miniature chocolate chips for eyes, pointed end first and allow to dry. Don't refrigerate these; doing so will cause the coating to weep or melt. They can be frozen, however. Idea adapted from one on found on Skinny Taste.